Hi I’m Nicky, I have been sharing the wisdom of our Shaman ancestors for over 20 years. This does not make me an expert. I have come to realize by sharing the knowledge through storytelling and providing the opportunity to experience shamanic techniques in a supportive environment, this wisdom is something each person begins to build their own personal relationship with. Like any successful athlete, a Shaman is continuously in training, refining, improving and becoming more aware. The Gold medal is waking up to how much power we each have to make a difference in our lives. And it truly makes a difference. The basic tools for the shaman in training are fundamental tools for everyone in everyday life. Shamanism is more than just a trendy word, the self -awareness required to work as a shaman is possible for everyone. Life is a journey and the shaman see the journey following the 4 cardinal directions of South, West, North and East known as the Medicine Wheel. These 4 directions are seen as the organizing principles of all of life and show up in most philosophies and belief systems including science. The fascinating part is that nothing is new it purely exists under a different name or is rediscovered. One of the most important teachings in the Shamanic way is to be open-minded and open hearted. The shaman knows that any belief is only true as long as we buy into it and hold it as true. They also know that evolving is being open minded enough to let go of core beliefs so that something else is possible. This has happened throughout our human evolution both personally and globally. The origin of this particular shamanic philosophy dates back more than 5000 years and has been cherished and passed down from generation to generation as an oral tradition. The Q’ero people, the last remaining descendants of the Inka, recognized in their prophecies, that the Spanish conquistador would arrive and the Q’ero Elders took the decision to move their community high up into the mountains above the tree line to safe guard their way of life. Shaman and shamanism remained relatively unknown until the mid 20th century. When the Q’ero shaman began to come down from the mountains, it was because they had seen in their prophecies that their knowledge was going to be of assistance and of service to people in the fast changing world that we experience today. The key aspects of the medicine teachings are as applicable to life today as they have always been. The Shaman knows that we all have an interconnected relationship with everything we know and see as our reality and everything we cannot see. They know this as the world of matter and the world of energy. It is the shaman’s skill to be able to move between these worlds that empowers others to find balance and transform their lives. The philosophy encompasses the knowledge that we are all caretakers of this incredible and formidable world that we live upon. That the life we experience comes from our own perception and each one of us has our own unique perception of reality. From this perception we create a map to help us navigate through our lives and make sense of the world, as we perceive it. The Shaman knows that by changing our perception we can change our view and experience of our world. The world is real we just mistake our version as the only reality because that is how we experience the world personally. And to top it all we get so used to others telling us what to do we forget that we have the power to make the changes ourselves and instead wait for others to do it for us. The journey around the medicine wheel is experiential and introduces us to some very useful tools of the shaman. These include the idea and use of opening a sacred space and how this can assist us to raise our awareness and create a shift in our perception. We look at the different levels at which we engage with the world naturally but bring more conscious awareness to them and this ties in with various tools which assist us to make those shifts and approach whatever experience or encounter we find ourselves in from a place that opens up opportunity for a higher outcome for everyone involved. It does not mean that it will not be uncomfortable but opens up possibility for something new or different rather than a repeat of the past. In the South direction we look at the story we tell about us and our life and how we identify with it. Here we realize we are much more than the story we tell. We look at how we can get bound by the script of our story and learn we can begin to release ourselves from our personal expectations and the expectations of others based on our story. The technique can then be applied to any situation in our life as we can stop and look at what part of the script in our story is not working and then use a shift in our level of engagement to re write the script ourselves. This can be a behavior, a belief, a situation or an emotion. Anything that we find that we are identifying ourselves with to the point that we think and believe this is who we are. In the West we begin to release and move away from old patterns, beliefs and behaviors so we begin to differentiate. It may be that you begin to realize you are not just a mum. Or you realize that a belief you have about yourself is perhaps not as true as you held it to be. 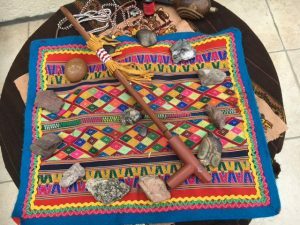 We look at how we can be influenced by stories, patterns and behaviors from our ancestors and again use tools to help us to step away for the energy of these bringing our ancestors to a place of honoring whether we like them or not. There is good reason for the ancestor celebrations we see that continue in Earth cultures today. By creating an altar to their ancestors they know exactly where they are. They are on the altar and not living through them. We take a look at shadow and projection and how this can play out in our lives and sabotage our best efforts to improve our relationship with our life. In the North we begin to learn to look for the wisdom in a situation and integrate this into our life. You may look at old family patterns for example and ask yourself how do I hold them now. What nugget of gold have I integrated into my life. Like the infant who identifies with their family, the adolescent who differentiates from their family and the young adult who integrates back into the family at a new level. We no longer look to blame others for the place we find ourselves in as hard as this is sometimes. We begin to experience encounters as opportunities to see something about ourselves and we meet our perceived enemies as adversaries who have shown up at this time as part of the opportunity for evolution to occur in our way of thinking, believing and behaving. And we recognize this is not just on a personal level but a global level. By the time we get to the North we remember that nothing is ever personal. Synchronicity begins to show up more in our life and we have the courage to go with the flow rather than attempting to control the outcome. In the East we take that step into our new map, we create that new coordinate that supports our transcendence of our old ways of being. What have you moved beyond? Maybe it is the old story, the role of victim, the role of mother, as you once knew it. We look at the role of death and how this symbolically assists us to move on in our lives and becomes an ally in assisting us to stay present to our life in the moment. We learn that everything is projection and that the world we experience is really a mirror of us on the inside. The greatest work any of us can ever do to be of service is to clear up our own back yard otherwise all we will envision for our children and the generations to come is more of the same or worse. In the East we wake up to how important this is. As we journey through life we are constantly moving around the medicine wheel. If you like the medicine wheel insights and tools become a map that assists us in every moment because it follows the circle there is no beginning or end. There is no past or future only now. The wheel teaches us to walk lightly on the earth to release ourselves from our stories, it teaches us to walk as the luminous warrior with no enemies in this world or the next, it teaches us to live consequently, we realize there are ripples that go out as a result of our thoughts, feelings and actions. And it teaches us how to transcend or to go beyond a certain belief, a pattern, an old outmoded behavior and how to create new coordinates in our map of life. This in turn opens the door for a new way of thinking, feeling and behaving.